Ancient people were fascinated by the way evergreens stayed green through all the bleak days of winter. It proved to them that these trees were still alive and reminded them that spring would come again. 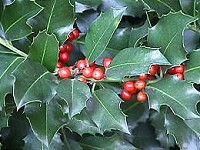 The Holly, from ancient times, was used by people in Britain to protect their homes from evil spirits. Witches and warlocks, are said to be deterred from entering by the holly's prickly leaves and also by its reputation for holiness (the word "holly" comes from holy). It was considered unlucky at Christmas not to have holly in the house. The Druids, who lived in Britain in pre-Christian times, are responsible for the use of mistletoe at Christmas. They worshipped the oak tree and as mistletoe grew on oak trees they regarded it as a very special plant and thought it possessed magical qualities that kept the sleeping oak alive during the cold winter days. They believed chopping down an oak tree covered in mistletoe promised death to the woodcutter within the year. The Druids dedicated mistletoe to the Goddess of Love, which explains the kissing that goes on under it. Originally, when a boy kissed a girl, he plucked a berry from the cluster and presented it to her. When the berries were gone, so were the kisses. For every kiss that's given. Victorians bound the mistletoe to a frame to make a "kissing ring." Each time a gentleman caught a lady under the mistletoe, he was allowed to claim a kiss. 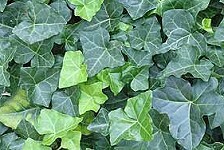 In decorating the house with evergreens at Christmas, care must be taken not to let ivy be used alone, or even predominate, as it is a plant of bad omen, and will prove injurious. When to take Christmas decorations down? It is unlucky if you don’t take your decorations down before the end of the 12th Day of Christmas, on the 5th January. This custom has been around since the reign of Victoria. Up until the 19th century, people would keep their decorations of holly, ivy, box, yew, laurel and mistletoe up until 2nd February, Candlemas Day, the end of the Christmas season, 40 days after the birth of Jesus.